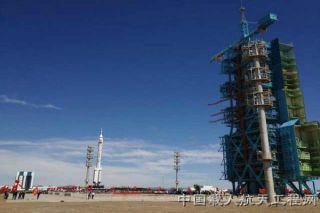 A Long March 2F rocket carrying the Shenzhou 9 rocket rolls out to the launch pad at China's Jiuquan Satellite Launch Center ahead of a planned June 2012 launch of the country's first manned space docking mission. China will launch its first manned mission to an orbiting space laboratory in mid-June, according to state media reports and the country's human spaceflight agency. A Long March 2F rocket will launch three astronauts aboard a Shenzhou 9 capsule for China's first manned space docking at the mini-space station Tiangong-1. The space lab module has been circling Earth unmanned since its launch last year. "The Shenzhou 9 will perform our country's first manned space docking mission with the orbiting Tiangong 1 space lab module," the Xinhua news agency quoted Zhou Jianping, chief designer of China's manned space program, as saying today (June 9). Zhou's comments came as he accompanied the rocket set to launch the Shenzhou 9 mission to a pad at China's Jiuquan Satellite Launch Center in the country's northwest region. The mission, Zhou told Xinhua, will be a major milestone for China's space exploration program. China's Shenzhou 9 mission will mark the fourth human spaceflight for the country, which has been making steady advances since the launch of Chinese astronaut Yang Liwei in 2003 on Shenzhou 5, the country's first human spaceflight. China is the third country to achieve human spaceflight after Russia and the United States. Since its first flight, China has launched two more manned missions, the two-man Shenzhou 6 flight and three-person Shenzhou 7 mission. Last September, China launched the Tiangong 1 module — a prototype for a future space station — into orbit. That launch was followed in November by the unmanned Shenzhou 8 mission, which successfully docked a capsule with the space laboratory twice during the test flight. The Shenzhou 9 mission will mark China's first human spaceflight to an orbiting module. Earlier this year, space program officials said the mission could also mark the first launch of China's first female astronaut, but a final decision on that is pending, Xinhua reported. This image released by the China Manned Space Engineering Office shows the Long March 2F rocket carrying the Shenzhou 9 capsule that will launch three astronauts to the Tiangong 1 space lab in June 2012. A translation of an announcement released online by the China Manned Space Engineering Office (CMSE), which oversees China's human spaceflight program, stated that preparations of both the rocket and Shenzhou 9 astronaut crew are going smoothly. A series of spacecraft and rocket tests, as well as final mission training, are underway ahead of the planned spaceflight, CMSE officials said. China's Shenzhou (or "Divine Vessel") spacecraft are three-module space capsules with a design originally based on Russia's Soyuz space capsules, but the Chinese vehicles carry substantial modifications. Like the Soyuz, Shenzhou vehicles carry up to three astronauts and consist of a propulsion module, a crew capsule and an orbital module. But unlike Russia's Soyuz, the orbital module of Shenzhou spacecraft carries its own solar arrays and can remain in space after its crew returns to Earth in the crew capsule. China's Tiangong 1 ("Heavenly Palace 1") space laboratory module, meanwhile, is a prototype space station designed to test the technologies required for a much larger space station complex currently under development. The Tiangong 1 module is 34 feet long (10.4 meters), 11 feet wide (3.35 m) and weighed about 8.5 metric tons. Chinese space officials have said the country is developing a larger, 60-ton space station that will consist of several modules. That space station is slated to be launched in 2020. China is currently following a three-step space exploration program that ultimately aims to land an astronaut on the moon. According to a white paper released by the Chinese government in December, the country plans to launch a series of robotic moon landers and a lunar sample-return mission by 2016. You can follow SPACE.com Managing Editor Tariq Malik on Twitter @tariqjmalik. Follow SPACE.com for the latest in space science and exploration news on Twitter @Spacedotcom. We're alsoon Facebook and Google+.